Culture Minister Miri Regev pushes back against proposal to enlist Ayelet Shaked in the Likud to keep her as Justice Minister. Culture and Sports Minister Miri Regev (Likud) pushed back Monday morning against suggestions the Likud could form a unity government with the center-left Blue and White party, or that the Likud should enable Justice Minister Ayelet Shaked to retain her position, despite her being kept out of the next Knesset. Speaking with Reshet Bet Monday morning, Minister Regev criticized fellow Likud lawmaker David Bitan over his proposal to have Ayelet Shaked join the Likud and reappoint her as Justice Minister. Shaked, who split off with Education Minister Naftali Bennett from the Jewish Home to form the New Right party, will likely be left out of the 21st Knesset. The New Right failed to cross the 3.25% electoral threshold in last Tuesday’s vote, according to the preliminary results. While the party needs just 1,344 more votes to pass the threshold, it is unlikely the final results – due to be submitted on Wednesday – will alter the party’s position. 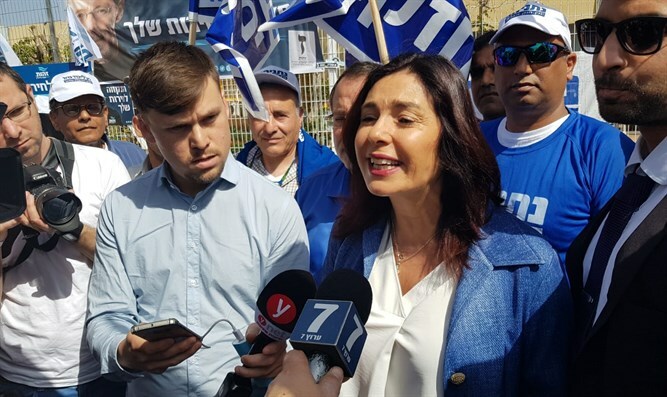 Regev went on to reject the idea of having Shaked retain her position as Justice Minister, saying she would need to work her way up through the party ranks if she were to join the Likud. The Culture Minister chided Shaked and Bennett over their decision to go it alone with the New Right, which cost the right-wing bloc over 138,000 votes. Regev also pushed back on calls for a unity government between the Likud and the center-left Blue and White party.